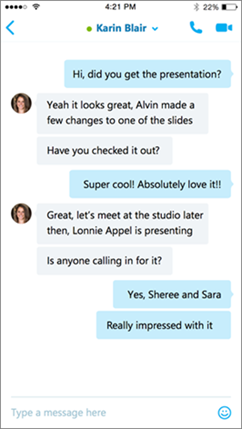 Use Skype for Business to quickly connect with co-workers and business partners. 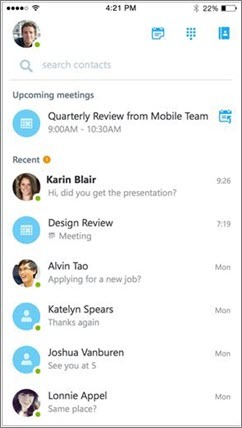 Skype for Business is instant messaging (IM), online meetings, calling, video conferencing, and sharing and collaboration all rolled into one package. When I make a Skype for Business call, does it use my mobile minutes? The Require Wi-Fi options for Voice, Video, and Meeting Content let you choose if you want to use the Wi-Fi network for audio and video calls. When you turn on Require Wi-Fi and a Wi-Fi connection isn’t available, Skype for Business tries to make the call by calling your mobile number instead. When you answer the incoming mobile call, you’re then connected to the Skype for Business call. As a result, your mobile minutes might be used. Can I see my conversation history on my iOS device? The conversation history on Skype for Business for iOS devices is now synced with Microsoft Exchange. This means that conversations that occur on your Skype for Business mobile device will be displayed on that device’s conversation history and also on Skype for Business. Use options on your iOS device to specify calls and meetings, contact options, and other overall settings. Depending on how your organization has set up Skype for Business, some of these options might be turned off. To access your options, tap your picture, and then tap Settings. Enter your iPhone’s mobile number with country/region codes. 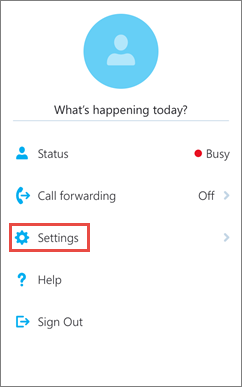 When Skype for Business cannot use Wi-Fi or the cellular data network to make an audio or video call, you’re called back at this number to connect you to the audio part of the Skype for Business call. When you first sign in to Skype for Business for iPhone, you’ll be guided to configure your Phone Number. To update it, on the Settings screen, under Calls and Meetings, tap Phone Number, and then enter your mobile phone number including the country/region and area code. On the Settings screen, slide the Voice switch on or off. On the Settings screen, and slide the Video switch on or off. On the Settings screen, and slide the Meeting Content switch on or off. By default, the My Credentials option is turned on so all your meeting and voice mail information is shown on Skype for Business. HTTP Proxy settings are needed if your corporate network has a proxy that requires credentials setup to sign in and use the application on your corporate Wi-Fi.